We use investor sentiment as a contrarian indicator of where the market is headed since investors are usually wrong. As we pointed out in last week’s sentiment report investors were registering extreme caution and fear just before the equity markets’ recent big upward moves. Now this week, continuing the trend of a week ago, investor sentiment has gone from fearful to neutral, but moving toward resistance levels. That, as we said in our last report, indicates smart investors should exercise caution by taking recent gains and reducing exposure. The CNN short-term Fear/Greed was in the single digits three weeks ago, meaning investor sentiment was very fearful. This week it climbed up to 43, well into neutral sentiment territory but slowly moving toward resistance levels. The Ned Davis Research short-term gauge also bounced quite a bit to a neutral 44 from very fearful single digits three weeks ago. Intermediate-term sentiment also bounced quite a bit. 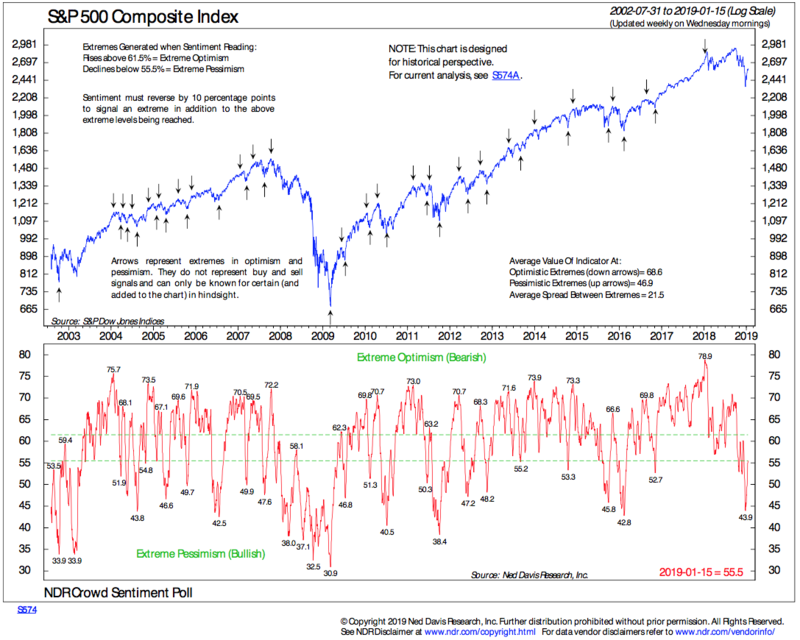 NDR crowd sentiment moved up to a current neutral reading of 55. The Investor Intelligence Bulls/Bears poll of market newsletter writers jumped to 43% bulls while bears retreated to 26% from 34%. Three weeks ago the bulls/bears spread was a negative 5. The spread is now well into positive territory at a positive 17. The extreme negative sentiment that created the recent bottom has now evaporated as stocks moved higher. The market remains in a fragile state with many stocks recovering to their resistance levels of oversupply where sellers outnumber buyers, putting downward pressure on stock prices. Typically bottoms are created with a series of corrections. And we are not there yet. The fourth quarter down move is only one of many more that we expect before stocks reach the oversold levels that would trigger a durable, longer-term rally.